ستكون هذه الفرشة في أعلى قائمة الأحذية الرياضية الخاصة بك! الجزء العلوي مصنوع من الجلد الصناعي مع تفاصيل وخياطة كلاسيكية من سكيتشرز. إغلاق برباط مع حلقات معدنية على شكل ثقوب ياقة مبطنة وطوق. بطانة ناعمة من القماش. نعل داخلي مبطن. نعل أوسط ممتص للصدمات. نعل مطاطي مرن. مستوردة. القياسات: ارتفاع الكعب: 1 3⁄4 بوصة الوزن: 14 أونصة تم أخذ قياسات المنتج باستخدام المقاس 9، العرض B - وسط. يرجى ملاحظة أن القياسات قد تختلف حسب المقاس. وزن الحذاء يعتمد على قطعة واحدة، وليس على زوج. I purchased them for work at a job where I'll be on my feet 9-10 hours (maybe more) on concrete floors. I've worn them 3 times now for up to 8 hours and my feet and legs don't hurt any more after work. I would highly recommend them to anyone who spends lots of time on their feet!! I bought these for the stitched toe. It's very hard to find shoes which stitches toes anymore. These shoes look great but as others have mentioned the material of the uppers feels off, definitely cheap and I can already see the white coloring flake off. Shame they use such horrible material on a "premium" line. Other wise the shoe feels true to size, they are incredibly light, the rubber outer sole is very nice. As for the inner sole, no arch support at all, no heel cup. I have to use inserts in these in order to wear them(plantar fasciitis). The inner sole does not seem to be removable either so my foot ends up losing a lot of room I should have had in these. This will probably be my last pair of skechers, they used to be all I would ever buy but really stayed losing me with the memory foam insoles. I just bought my second pair (my first pair is still in excellent shape, but I love them so much, I decided I had to get a back up pair in case they ever get discontinued!). These shoes are about the only pair I've had that keep my feet feeling well after a long walk and even a lot of standing. I have plantar fasciitis and standing and walking for long periods are rather brutal otherwise. The thickness of the bottom of these shoes means I don't feel like I'm standing directly on the concrete/pavement after a few months. They are padded all around so there is nothing to rub or irritate your feet anywhere in the shoe. These cause no issues even when breaking them in the first time...the very first time I put these on, I went for a walk for 1.5 hours and nothing bothered me at all! The only thing I wish, in a perfect world, is that they made this exact shoe without shoelaces! I have arthritis and it's particularly bad in my fingers in the morning and it can be difficult for me to tie the shoes. Please create this same shoe with no laces so they're even easier to get on and off! I have worn Skechers for years, buying same shoe, same size, until last few years. I have spent a small sum trying to find the shoe that fits like the past ones, I had to buy inserts for the last two pairs, because the sole is as hard as a rock, WHAT GIVES with Skeckers comfy tennis. one pair I bought the hole where you insert foot was so tight and hard, no way to get your foot in the shoe. I returned them. The best shoe they made you can't find it anymore. the slide with no laces and full tennis with no laces, and oh so comfy. They have also taken the arch support out of the sole, I need the support. Please give us back our comfy shoes. If you made these leather shoes in all colors, people would be happy. all you have is white on the slides and black & white on slip on. we need blue, & brown for sure, to be able to wear them to work. I wore the new black pair and they were so hard, I had leg and back pain just from being in them 3 hours in and out to appts. 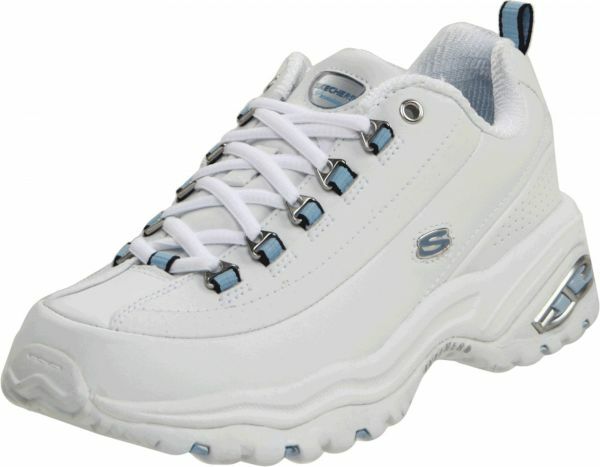 The old skechers, take them out the box, put on and you never have any aches and pains. You have taken the good shoes away and given us aches and pains. Skechers have worked well for me for a number of years. I wanted to get away from the sports/running shoe look, so I chose the black Nubuck style. These shoes remind me of the hiking shoes I bought when I lived in Germany! I did not pay close attention to the fact that the insoles are not memory foam and are not removable. I realized that the insole was too stiff for me because I require a much softer insole. The price of this shoe was outstanding, while other colors and outer material might be more expensive. The price allowed me to spend a bit more money and purchase memory foam insoles. My only caution is if you might want softer insoles, be sure that there is enough room in the shoe to accommodate the extra material, again, the original insoles cannot be removed! I usually buy a 1/2 size larger shoe because I need extra room in the footbed and toe area; therefore, I have plenty of room in the shoe to accommodate the additional insoles. Also, the shoe is very lightweight in-spite of the sturdiness of the build.